View More In GPS Trackers - Page 5. Its small size (3in x 1.5in x 1in) makes the GPS Tracker very portable. An internal motion sensor will help maximize battery charge when not in use by entering in standby mode. Follow the units track minute by minute (upgradable) on the user friendly tracking website with Google Maps. Receive alerts to pre-defined SMS numbers and email addresses when the central button on the tracker has been pressed. 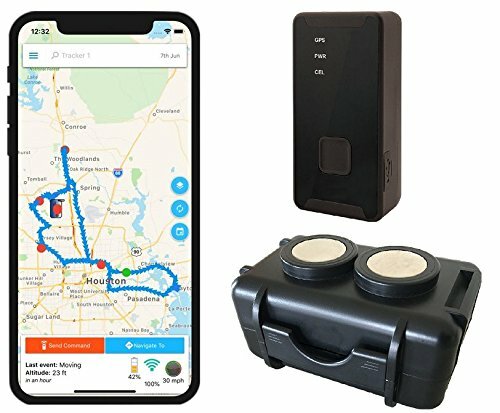 Get alerts from the GPS Tracker for speeding, entering or leaving predefined areas or when the tracker's battery charge is low. Works great for tracking: Cars, trucks, elderly, children and assets. Service Price: $19.95/Month. Credit/Debit Card. SIM Card and Data Plan are included. Service coverage limited to work only in the USA. First the Tracking unit receives a GPS signal from the sky, this signal can go through plastics, fabrics, under a car seat, in the glove compartment, even under a car. Testing your tracker is the best way to find out where it will work best for you. Next, a second signal is sent from The Tracking unit to our servers; using Cellular Phone Company networks for real time tracking. When no cellular signal is available the Tracking Unit will save the track in its memory until it regains signal. Battery charge may last about 1 week depending on use and report frequency. And last, you will access all this information through the GPS tracking website with Google Maps and tracking tools when you want.. Sometimes you may get a drift on the map position if the Tracking Unit is placed in a much concealed location or indoors. Please be aware that the signal will not work if the Tracker is totally enclosed in metal or inside buildings. Note that more frequent position report updates will use battery charge more quickly. Magnetic: Strong Neodymium (NdFeB) Magnets. inside dimensions 3.2x1.5x1.8 inches..
$19.95 per month - Cancel Anytime - No Contract - No Hidden Fees - Customizable position report frequency from 30 Seconds while moving. Upgradable to 10 seconds. If you have any questions about this product by Optimus Tracker, contact us by completing and submitting the form below. If you are looking for a specif part number, please include it with your message.